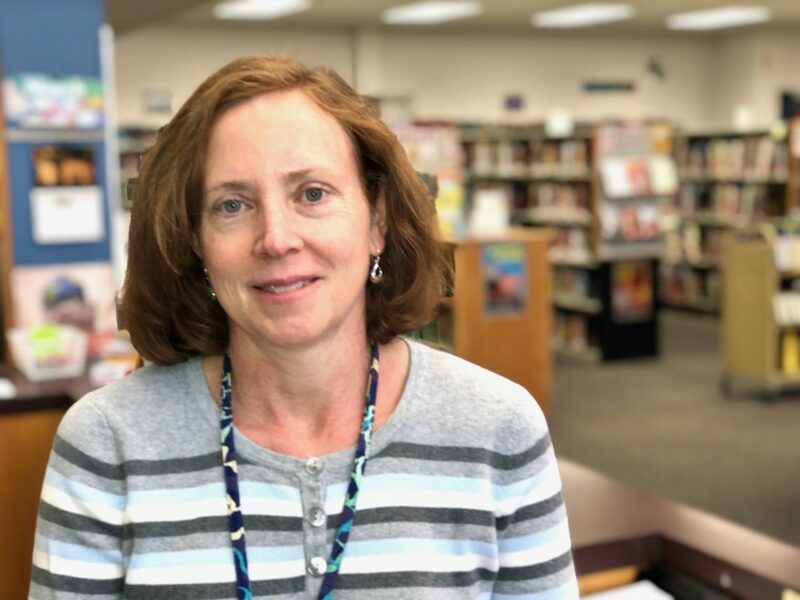 Clague Middle School librarian Kim McLean grew up in Philadelphia and graduated from Temple University, where she studied communications and theater. She started her career in book publishing, where she worked in marketing and public relations for a variety of publishers, including Congressional Quarterly Publishing in Washington, D.C. and Rand McNally in Chicago. After staying home to raise her two children while working part-time for the Lamaze Association and the Wild Swan Theater, McLean returned to school to earn her master of science in information degree from the University of Michigan in 2010. She met her husband, Austin, during a study abroad program in London, England during her junior year in college. The Ann Arbor residents have been married for 25 years and have two children, Neil and Grant. Neil graduated this past spring from the College of William and Mary with a bachelor’s degree in business administration and art history, and is now working as a cloud solution engineer for Oracle in Washington, D.C. Grant is a sophomore at Villanova University studying business and history. He is on the ultimate frisbee team and will be studying abroad in London next year. What inspired you to study library science? When my boys were attending Lawton Elementary school, I volunteered in their library helping with book circulation and book fairs. 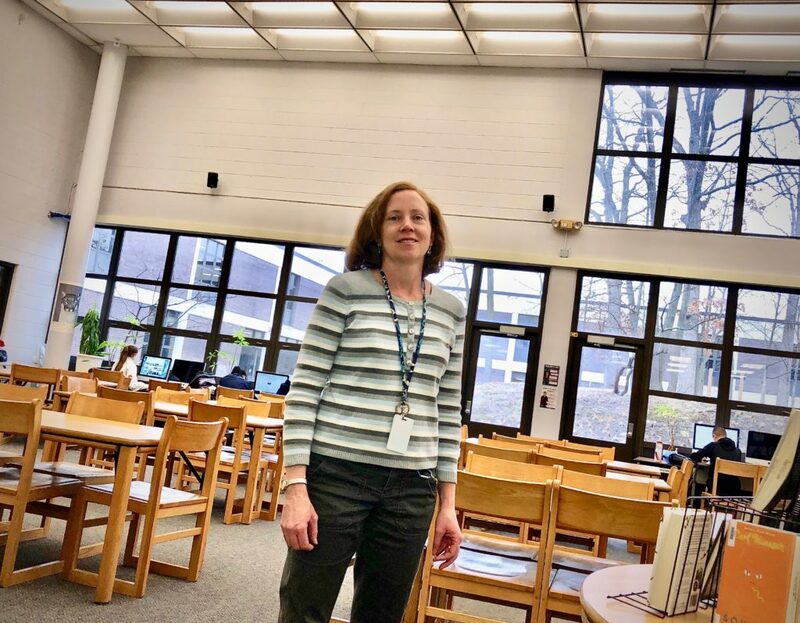 After seven years of volunteering, I took a job as a media clerk at Tappan Middle School and realized how much I absolutely loved working in the school library. The only thing holding me back was a degree, so with the encouragement of the librarians I had volunteered and worked for, I decided to apply to the University of Michigan. Not only did I get into the program, but I also received a non-traditional scholarship awarded to students who have been out of college for more than five years. This cemented my decision to return to school. After two years in a full-time program in the School of Education, I earned my teaching certification and at the School of Information, I received my master’s degree. Why are school media centers so important? Libraries are the heart of school, the working muscle that information flows in and out of every day. Physically, libraries are necessary to provide a space for people to come together and to house books, resources, and computers. However, what makes a library invaluable is one that is staffed by a certified librarian. A professional librarian has the necessary knowledge and skills needed to provide the information literacy instruction so crucial to digital natives who need guidance on research skills, identifying fake news, avoids scam and schemes and being safe online. Skills that they will need and use for the rest of their lives, well beyond their middle school years. What three books have had the most influence on your life? Where the Wild Things Are by Maurice Sendak. As a shy child, I loved the idea of being able to escape into a world where you can be “the king of all wild things” even if it was only for a brief time before you were called to dinner. Harry Potter by J.K. Rowling. This book made reading fun and cool again! It became an infectious phenomenon that helped get kids excited about reading, with book store lines around the corner at midnight with the release of each new edition to the series. Describe an average workday. What I love most about my job is that this is no average workday. Every day is different. Because the middle school library has flexible scheduling, there is something different happening every day. One day I am teaching research skills or website evaluation, another day I am teaching digital citizenship or a technology tool. One day I am weeding the collection, another day I am hosting an author Skype visit. One day I am demonstrating a tech tip to our staff, another day I am pulling books for a genre cart. One day I am running an hour of code session, another day I am hosting a book fair. I could go on and on long before any day would repeat. Favorite websites: Commonsensemedia.org has many fantastic resources for parents and teachers including a detailed digital citizenship curriculum. In 2016, Clague became the first school in the district certified as a Commons Sense Media Digital Citizenship certified school, which means that every Clague student participated in three lessons each on topics including digital footprint, cyber-bullying, online safety, and strategic searching. Each year we renew this certification as a testament to our commitment to digital citizenship. Favorite App: My favorite app is Libby by Overdrive. This app provides you with access to thousands of ebooks and audiobooks through your local public library card. I can’t possibly read every book in the school library, but I listen to them every day on my commute to and from work. I also present this app to students during their advisory periods to make them aware of this fantastic, free resource. How can a parent encourage their kids to read more? Be a role model. Read every day! Read with your kids. I read with my kids every night all the way through middle school. If you show your kids that you value reading, they will too! How do you feel about the switch from using “media specialist” to “librarian”? I think that it is a great improvement to switch titles from “media specialist” to “librarian.” We are not specialists in media, but rather professionals who provide access to information. How do you keep students engaged? I keep students engaged by ensuring that the library collection, instruction, and programming reflect our students’ needs and interests. I solicit book suggestions from students regularly, survey student for feedback on programs, and tailor lessons to accommodate all student learning modalities. What is the most rewarding part of your work? The most rewarding part of my work is finding creative ways to connect with students’ love of reading and passion for learning. One program I started at Clague is the book bowl. 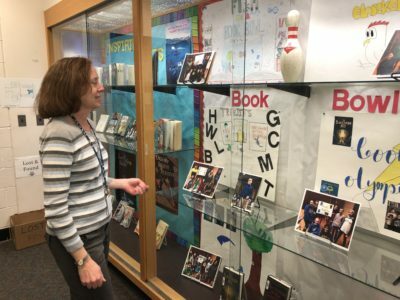 The book bowl is a voluntary program for 6th and 7th graders, who read three books over three months and meet once a week during their advisory period to review questions and create posters. The book bowl culminates into a light-hearted competition where up to six teams compete to answer the most questions correctly about each title, earning points as they go. We just hosted our 6th grade book bowl during March is Reading Month and had 65 students participate. It is a wonderful opportunity to give students the chance to shine and share their knowledge and passion for reading. How do you recharge? The best way for me to recharge is by connecting with my professional learning network. I love meeting with my peers either at department meetings, social networking or at professional conferences. I just recently attended the MACUL (Michigan Association for Computer Users in Learning) conference and came back with a Google drive full of fantastic resources and ideas that I will not only use in my own instruction but also share with my building staff and library colleagues. How do you spend your summers? I spend summers up north near Petoskey with my family. Many years I have been fortunate enough to be able to travel abroad as well including trips to Australia, Europe, Asia, and Russia. I absolutely love to travel and explore new cultures, so I travel as much as possible especially during the summer vacation months. When I am not traveling, I enjoy running, tennis and of course, reading. I have run several 5Ks with my son Grant who is a great inspiration to me. I also participate in many tennis programs with the encouragement of my son Neil who keeps me humble on the tennis courts. In the summer, I also use the time to learn new tech tools, create lessons and read as much as possible. I never stop learning. I feel so blessed to be part of a profession that allows you to reset each year. After a summer of reflection, I am able to start each school year with as a fresh start and an optimistic attitude. What’s most exciting about your professional life right now? This year I have placed great emphasis on community and diversity. My goal has been to build community not just within the school but making connections outside our school and beyond our community. Within our school, I have created a small makerspace area where students freely create and design collaborative projects including 4,000 piece sticker mosaics as well as “make & take” projects such as coloring bookmarks or origami. We also have an active Library Squad of student volunteers who assist with various projects, which has now branched out to include a Tech Crew, who assist with technology needs in the labs. Outside of Clague, I have been able to recruit a committed group of parent volunteers who assist with book shelving and circulation, book fairs, book bowls, and special projects. I also work with an organization called Operation Paperback to collect gently used books which are donated to the military and their families. We collected over 500 books last year thanks to the generosity of the Clague families. Clague is indeed fortunate to have Ms. McLean directing the activity in Clague’s media center. There is a place for every type of student to work and learn in a comfortable environment. Ms. Bourgon is a wonderful assistant, as are the many parents who help with Book Bowl and other library needs. Kim is a product of Philadelphia’s Public Schools! We are VERY proud of her! Ms. McLean is a treasure at Clague! As PTSO President, I appreciate her participation in our PTSO as a Staff Liaison and am always blown away by her creative, student-involving initiatives. Students at Clague LOVE reading, and talk animatedly about books. So much of this enthusiasm for good old-fashioned reading is directly because of her passion for books. Wow, are we fortunate at Clague to have her!